Kheema paratha or ceylon paratha is a delicious and popular paratha. 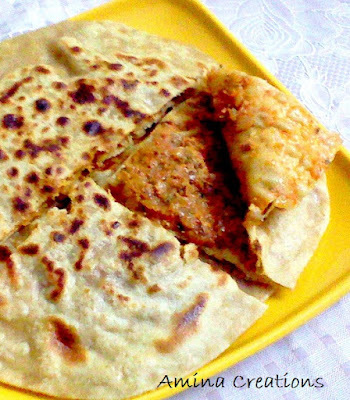 Here whole wheat rotis and spicy minced meat (kheema) filling is prepared and the kheema is placed between two rotis and sealed with egg mixture. You can prepare the kheema in advance and use it to make the parathas. These parathas serve as a filling meal for breakfast, lunch or dinner. Alternately you can also prepare Kheema wraps which will be a perfect lunch box recipe. First begin by kneading the dough for the parathas. For this take flour, salt in a bowl, add water little by little and knead to form a soft and smooth dough. It should neither be too firm nor too loose. Cover with a lid and set aside. Meanwhile prepare the kheema filling. For this heat oil in a pressure cooker, add cardamom, cinnamon, onions and saute till the onions turn slightly golden. Then add garlic paste, ginger paste, chilli powder, tomatoes and salt. Mix well and cook for a minute. Then add minced meat, mix well and allow it to blend well with the masalas. Finally add ½ cup of water along with coriander and mint leaves. Close the lid and cook for 10 minutes. Open the lid, add lime juice and water if necessary and bring to a boil. Reduce the heat and cook for 5 minutes. When most of the water has evaporated and it has a thick gravy consistency, switch off the gas and allow it to cool. Now to prepare the parathas, keep the kheema ready in a bowl. Beat the egg separately in a bowl and keep this ready as well. Now take the dough and divide it into 8 equal balls. Take 1 ball and make a roti. For making a roti, dust the surface with flour and roll the dough ball to form a circle. Add ½ to 1 tsp of oil at the centre, spread it evenly and cut with the spoon as shown. Roll along the radius to form a cone, place it upright and press. Dust it with flour and roll again to form a circle of uniform thickness and set aside in a plate. Take another ball and roll this also into a roti. Layer the first roti with kheema as shown. Apply egg in the empty space and cover with the second roti. Press only at the sides, not at the centre. Carefully transfer this to a hot pan or tava. Cook on one side, turn and cook on the other side. Apply oil on both sides and cook till brown patches are visible on both sides. In this method, make all the other parathas. This recipe makes 4 parathas. Serve hot. It does not need any side dish and can be had as it is. Yummy yum mouthwatering parathas..never tried this way!! Umm... paratha looks yummy and once had it in a restaurant. Yummy! this would be great just on it's own. Wow, nice blog, I also like the naan, I am following you! Simple and delicious recipe.. looks absolutely inviting !! wow am drooling dear...love it...will surely try this....thanks for sharing! Thank you for sharing your blog with us and the many readers of our blog directory. You can also submit recipes to Indian Cooking Blogs to drive traffic to your blog. Keep up the great work and we look forward to your future post. Yum yum, wat a super inviting parathas,makes me hungry. Thankyou so much friends for your comments.. Hi Amy,I am not sure how the name Ceylon came about, but this is how it is called here.. Thankyou so much for passing on the link..do try this recipe.. will be glad to hear your experience... hope you like it..